STX Heavy Industries, a Korean EPC, recently implemented flue-gas desulfurization (FGD) at a coal-based power plant in Chile in order to comply with the country’s strict environmental regulations. The FGD system removes sulfur dioxide (SO2) and sulfur trioxide (SO3), which cause environmental damage, particularly by contributing to the formation of acid rain. The FGD process requires large amounts of high-quality water. Because its previous desalination plant wasn’t able to meet its needs, STX chose Fluence to design, manufacture, supply, commission, and supervise a seawater desalination plant at its ENDESA CELTA power plant on the seashore in Tarapaca, Chile. The new plant provides 2,400 m3/d of high-quality, desalinated process water for FGD and other needs. One of the main challenges the project faced was the very limited footprint available for the desalination plant. Because the CELTA power plant is located in a zone of high seismic activity, all metal structures, tanks, and other equipment had to be engineered to meet Chile’s strict seismic standards. To ensure a steady supply of desalinated water, the system was designed with 100% duty-standby redundancy across all aspects of the plant, including electromechanical equipment and PLC, as well as pretreatment and desalination units. The system is working at full capacity in compliance with water quality specifications. 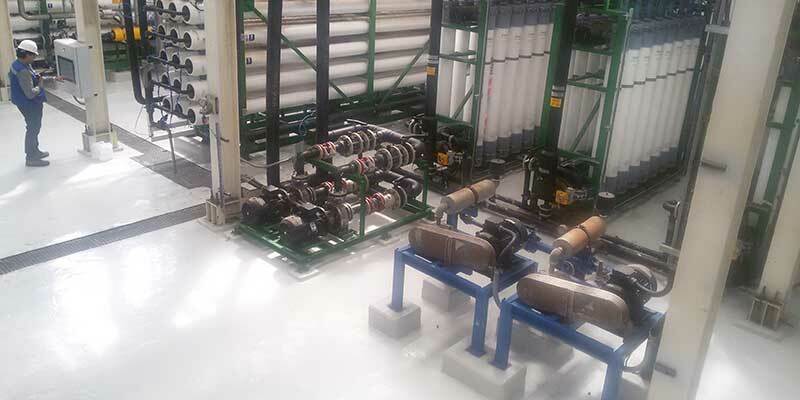 Screen filtration, membrane ultrafiltration, two parallel trains of seawater reverse osmosis, energy recovery, and CIP with a chemical neutralization system.